If you think your sweat is worth some dough, look no further than Sweatcoin. This free fitness app takes in steps and outputs a new currency — Sweatcoin. Earn enough and you can buy items from a revolving selection in the app’s store page. Some of the offers are fitness related. For example, right now users can spend Sweatcoins on a 6 month subscription to Edamam. It’s a service that helps users track and organize the nutritional data for what they eat and provides diet recommendations. If that doesn’t sound like you’re thing, that’s fine. 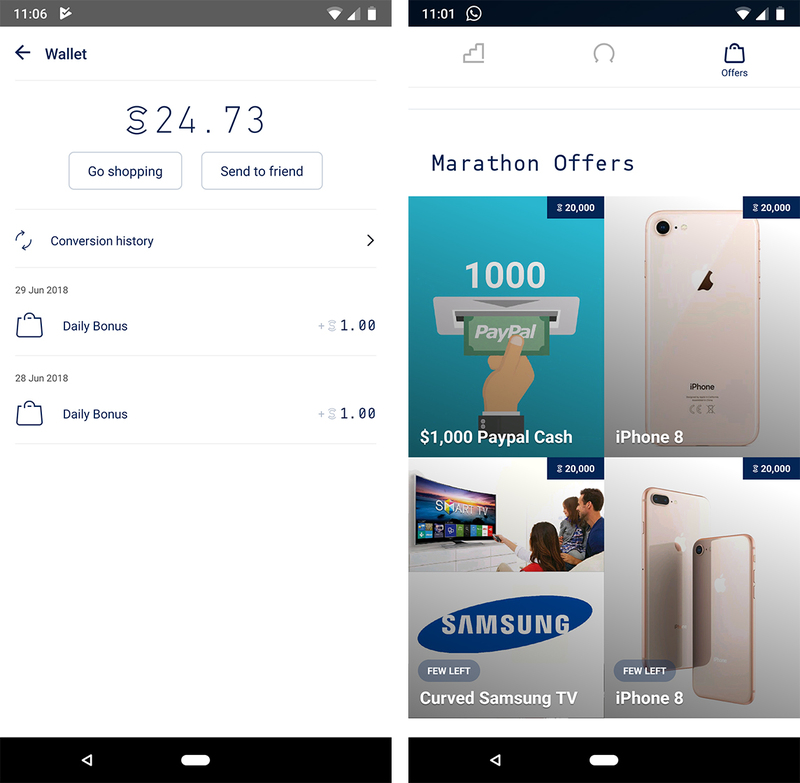 Sweatcoin offers other items, including magazine subscriptions, FitBits, iPhones, $1,000 cash and, in a most ironic twist, Samsung TVs. The idea behind Sweatcoin, developed by London start-up Sweatco, is that evolution works against people. Sweatco believes nature built people for times of hardship and difficulty — not times of plenty. Nature wired the brain to give more weight to payoffs that are closer to the present. Known as Present Bias, it’s a mechanism that’s supposed to help us survive. However in the current day, it’s the reason we’d rather binge Netflix and eat fast food. The payoffs are immediate. Sweatco proposes a solution: make exercise instantly gratifying so that Present Bias works for you instead. Sweatcoin uses GPS signals and motion data to collect steps. 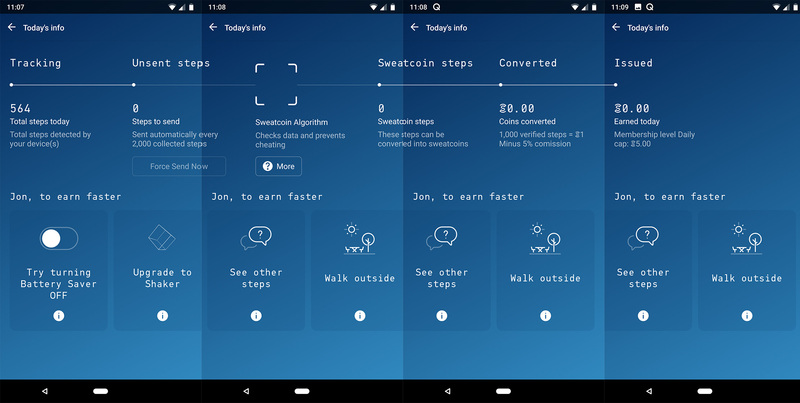 It then puts those steps through an algorithm to calculate earnings (above) In theory, 1,000 steps is equivalent to one Sweatcoin. However users earn less in practice. Sweatco takes a commission off your earnings amounting to about five percent. The commission is to help “keep the lights on” according to the app’s fine print. Furthermore, users can choose a number of membership tiers to join. The higher the tier you join, the more Sweatcoin you can earn each day and month. However the tiers have a monthly membership fee, paid in Sweatcoin. Additionally, the app only counts outdoor steps, which is why it uses GPS. And the use of GPS means more battery usage. Sweatcoin has a battery saver mode, but turning it on restricts tracking and nets you less coin. Finally, certain common behaviours can affect the step count as well. Things like using a protective case, walking when connected to wi-fi, or walking slowly can reduce your steps too. 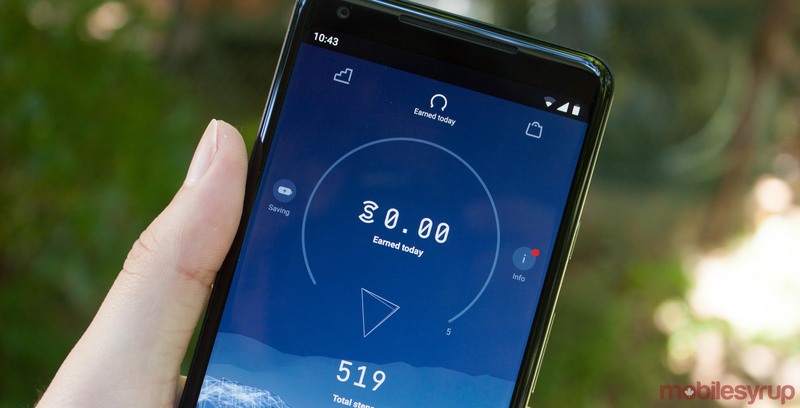 It means that the app’s algorithm, which is designed to detect outdoor steps and prevent fraudulent use — such as strapping a phone to a pet to earn Sweatcoins — will only net users about 65 percent of their total steps. However, Sweatco is working to improve the speed and accuracy of its algorithm. Additionally, the company is working on a verification algorithm for indoor steps. Sweatcoin has its flaws, but if you’re looking for a motivational fitness app that gives back for what you put in, this app is for you. Sweatcoin’s strength is that it gives a currency. Apps like Carrot offer a number of reward points programs as motivation. However, you can only earn for one at a time. Users end up having to decide what they want to earn, whether it’s free movies or discounts at the pump. Sweatcoin ends up being less limited since the earnings are flexible. However, users are still limited to what’s in the store. Sweatcoin is available for free on iOS and Android devices.